Here at Balanced Health Medical, we provide treatments like acupuncture, massage therapy, chiropractic care, physical therapy, and sports medicine for those in Midtown, New York. Of course, those in the Upper East Side and Rockefeller also trust our doctor and staff to treat their short-term or long-term pain. One such cause of this pain may be shooting aches and lack of sensation in the elbow. With chiropractic care, we can treat elbow issues. •	Medial epicondylitis or golfer’s elbow. Of course, you don’t have to enjoy a good game of golf to develop this condition. If the elbow’s joints, tendons, and muscles become swollen and inflamed from doing the same thing over and over again, you may have golfer’s elbow. You’ll also notice lack of elbow flexibility and a feeling of weakness. •	Lateral epicondylitis or tennis elbow. The cause is often the same as golfer’s elbow, but this condition affects the outer forearm while golfer’s elbow affects the inner forearm. •	Elbow osteoarthritis or arthritis. The elbow joint breaks down and loses its cartilage, either from injury, a medical condition, or age. 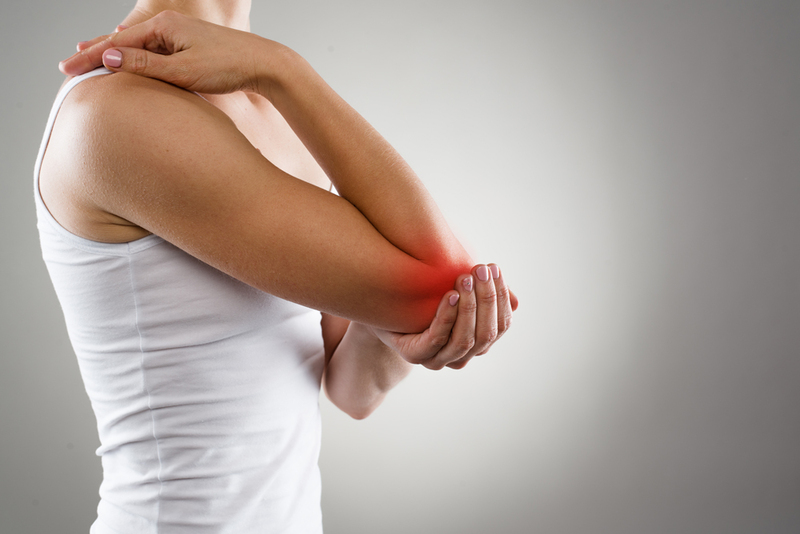 Playing sports regularly or doing a manual labor job may also lead to elbow arthritis. You’ll experience crepitus or a grinding feeling, stiffness, lack of mobility, and elbow joint swelling. •	Radial and cubital tunnel syndromes. The elbow joint is where the radial nerve is found; the ulnar nerve (which is affected by cubital tunnel syndrome) is not far from it. In addition to pain, expect to feel pins and needles. •	Elbow sprains, strains, and other injuries. Whether you were involved in a slip and fall, a sports incident, an auto accident, or another incident, you could end up with these uncomfortable injuries. Sprains and strains don’t always heal on their own, and instead, require medical care. •	Elbow dislocations and fractures. The elbow has two bones, and either can be dislocated, fractured, or even broken. This too requires medical care, as a broken bone needs a cast to properly heal. With a combination of physical therapy and chiropractic care, our doctor can treat your elbow(s) if you have the above conditions. You’ll slowly regain your flexibility, mobility, and strength with these exercises. Chiropractic techniques like adjustments and manipulations can also treat pain at a joint or muscular level. Contact Your Midtown, New York Chiropractor Today! At Balanced Health Medical, we’re experts in elbow pain, but that’s not the only service we provide. We also treat pain in the knees, ankles, feet, hands, wrists, shoulders, hips, neck, and back. To set up an appointment with our chiropractor, give us a call at (212)-755-1717 or come see us at Balanced Health Medical on 133 East 58th Street, Suite 101.